Using Google Earth Using Google Earth: Can I Take My House Out of Google Earth? Can I Take My House Out of Google Earth? While it’s pretty cool to see your home in Google Earth (GE), some folks ask Google if they can take images of their home out of GE. The answer? Almost every GE newbie opens GE, finds the ‘fly to’ box and searches for their house (or maybe grandma’s house). If Google has their location available, they’ll most likely see the top of their house nestled amongst familiar community landmarks. Now, with Google’s Street View layer, you can often even swoop down onto the street and have a look around your neighborhood. For some people this enhancement can raise concerns, and so there is a ‘report a concern’ or ‘report an inappropriate image’ link at the bottom of most street view images so you can let Google know if something’s not quite right. Why isn’t this available for all of the Google Earth imagery? The explanation comes from looking at the sources of each type of imagery. Google partners with third-party data providers all over the world to be able to bring you the satellite and aerial images you see in most of Google Earth. Google doesn’t control satellites nor take these pictures themselves. If you’d simply like to have your house, car, etc. not show up anywhere in Google Earth that may be a little more of a challenge. 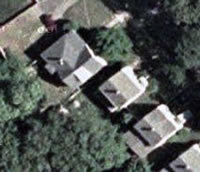 The images included in Google Earth are images that you’d be able to see by flying over someone’s house, and are in general, publically available. Moreover, Google doesn’t alter the content of images that we receive from third-party sources—Google won’t manually extract an image from what you see. If you’d like to still pursue getting an image taken out of the satellite imagery, your best bet is to directly contact the data provider that has taken the image and let them know that there’s a problem. The data provider is listed on the copyright line in the Google Earth images (at the bottom center of the Google Earth image). Next time you’re checking out your favorite places, take in all the possibilities, turn on the Street View layer.